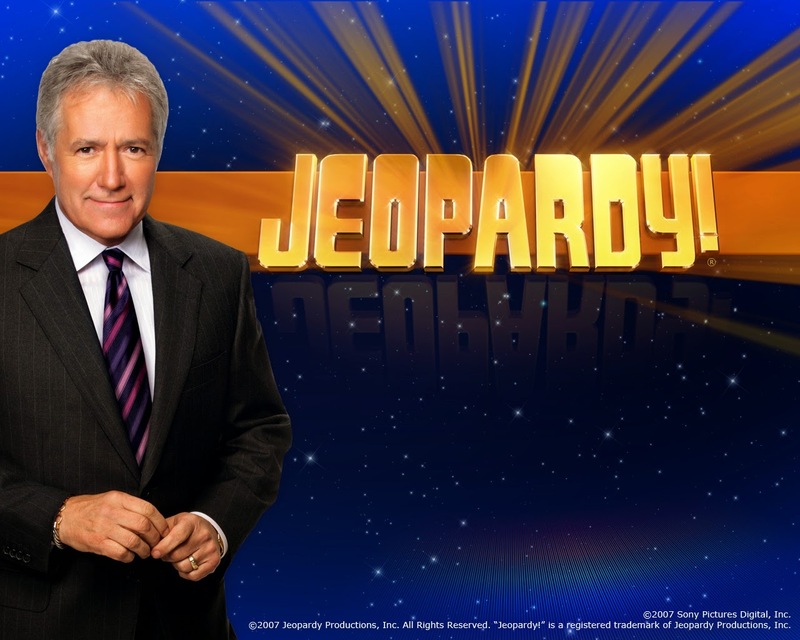 Left and Write: J is for : Jeopardy!! J is for : Jeopardy!! Created by Merv Griffin (the same guy who created Wheel of Fortune), Jeopardy has been around since 1964 and is seen, as many, as one of the premier "quiz shows" of all times. At least, I know it's one of my favorites. It was, originally, aired in a daytime slot on NBC up until 1975. From there it went nightly and syndicated. The original host was Art Fleming until 1984, then Alex Trebek took over. For the uninitiated, Jeopardy is a "general knowledge" game where you must answer in the form of a question. "I'll take Superman for $200.00 please, Alex." "This is the name Superman was born with." "Oh, sorry....the answer we were looking for is "What is Kal-El". If you get the question wrong, the amount is deducted from your score. It's very possible to wind up in the negatives if you aren't careful. The first round is made up of fairly simple (relatively speaking) questions. Round two is a bit harder and the dollar values of the questions are doubled. 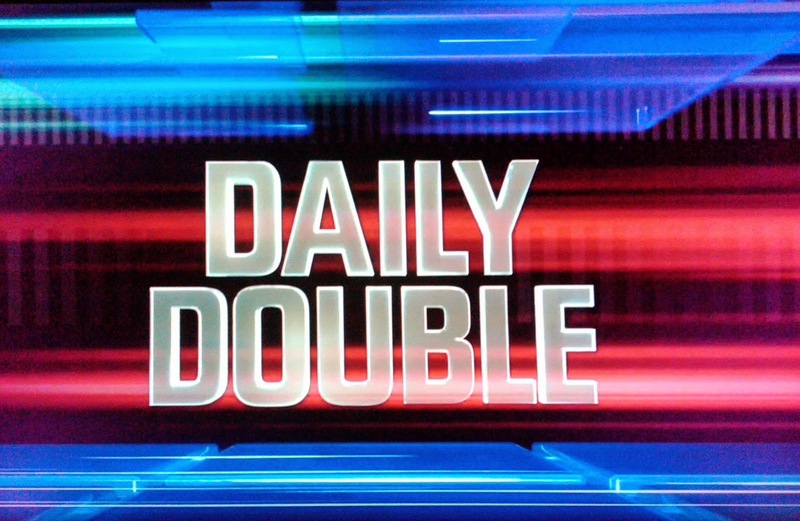 There's also a Daily Double, where you wager some or all of your total on one question. If you get it right, you get the amount you wagered added to your total. If not, it's taken away. If nothing else, it's a show that not only makes you think, but also measures how quick you can think. It's been parodied quite a bit. From Weird Al Yankovic's "I Lost On Jeopardy"
to Saturday Night Live's "Celebrity Jeopardy" (where Darrell Hammond's Sean Connery steals the show). Tune in tomorrow for a reporter who always seemed to stumble onto all sorts of supernatural mischief. Hey, I'm first today. How about that? I used to bone up for Jeapardy, hoping to out guess the contestants. I'm not good under pressure any time, so I'd be horrid at standing up there and trying to think like they did. But I racked up some good points and won tons of money in my armchair. I think I made it up through the zombie episode when I was re-watching tomorrow's show a couple of years ago. I need to get back on that. I love Jeopardy; it's always fun. And I am coming up empty on your clue for "K."
I love this show and some of the outtakes are hysterical Mark! Our family loves that show. Whenever the kids are home, we watch it and sometimes my husband I watch it together. I don't know anyone who doesn't watch or hasn't watched Jeopardy at some time in their lives. And the SNL one will live forever in my brain (who can forget Turd Ferguson?). I think I used to watch this, but I can't remember. I believe most of the world was watching that show... except me. The only times I ever saw game shows were if I happened in on a room where someone else was watching. I never became a fan, myself. I do recall, then, people at home shouting out the answer. Quite the family entertainment. I used to watch the Jetsons and a few times Josie and the Pussycats! Wow are we going back there! I'm not a huge fan of game shows but Jeopardy is one that I will watch if I happen to be where someone else is watching it. I loved the Jeffersons! Ah, the lure of Jeopardy. We had the "at home" version when I was a kid. I think playing it and watching the show got me into a good college. My family watched Jeopardy! every night and we had the board game and played it all the time. I have it on my iPad now, and play often against virtual contestants! I also still watch on TV. "Thank you Don Pardol Thank you friends!" I can STILL hear that in my head today, even though Alex took over decades ago and appears ready for retirement himself!